Fluke introduced the 8020A in the late 1970s as its first handheld DMM. These 3½-digit, 2000-count models can still be found on the used market, and can still be very useable, if they’re in working condition. Unfortunately though, LCD problems are common on this 30+ year-old device. This example was obtained rather inexpensively in a group of three derelict handheld meters. (See also: Elenco LCR Meter, Keithley 135 DMM) The LCD is obviously suffering from some malady that causes it to look dark. None of the segments can be seen at all. In an attempt to find out exactly which part of the LCD has turned dark, I carefully removed the polarized reflective backing. This reveals that the glass is still clear, and the backing is responsible for the darkening. But even placing the glass over a new piece of polarizing film and testing it shows that none of the segments work, so this display cannot be recovered. Getting a new LCD that exactly matches this Fluke part may be next to impossible. But this DMM is very basic and only needs 3½ digits with decimal points, a leading minus sign, and a low-battery annunciator. 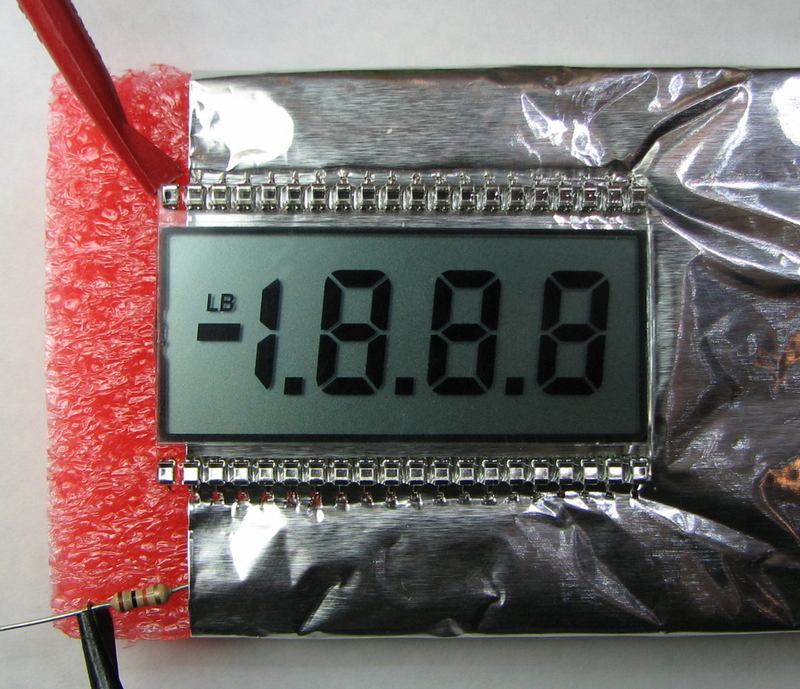 There are several readily-available generic 3½-digit LCDs that can possibly work. 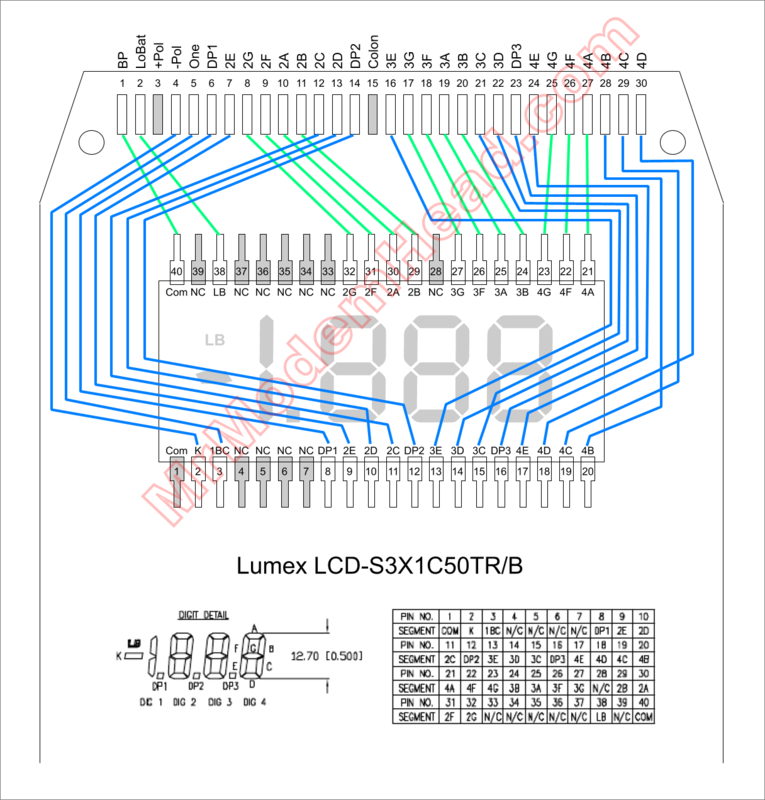 I chose the Lumex LCD-S3X1C50TR/B because it has exactly the same dimensions as the original LCD, and has exactly the features needed with no unneeded segments. The original display has a colon and a plus sign, which are not used, but have to be connected to the backplane clock signal to prevent being accidentally activated. The original LCD used a single elastomeric connector on the top edge for the 30 signals coming from the main PCB. The chosen replacement has a row of 20 0.1-inch pitch pins on both top and bottom edges. Therefore the plastic LCD support bracket will have to be milled to create relief areas for these pins. Great precision is not really required, but there are support posts on the back side that need to be left attached. This makes for a tight fit for the end pins on the back row. I chose to use single strands of solid 30-gauge insulated wire-wrap wire. For a mechanically secure connection to the LCD pins, I used a manual wire-wrap tool to make a secure wrap around each the LCD pins used. Small pieces of heat-shrink tubing provide strain relief and prevent accidental shorts. All of the wires are routed around to the front and threaded through a plastic strip that has been drilled with a row of 30 tiny holes at the same pitch as the PCB pads. This keeps the wires in order so that they can be carefully sorted out and lined up before being soldered to the pads. Soldering was a fairly quick process. The PCB pads were given a generous coat of flux. Holding the wire on the pad with a soldering aid and touching with a wet soldering iron tip created reliable joints. I checked and double-checked the wires against the connection diagram before soldering (and caught a couple of mistakes.) So after soldering, a power-up test reveals that the LCD is working correctly and there are no misconnections. Since this is the first time I’ve seen this particular DMM work, a quick calibration and function check is in order. As is often the case with old Fluke DMMs, this unit is still quite accurate. In order to check the low battery annunciator, the meter was powered from a variable DC power supply. Surprisingly the low battery condition is signaled below 7.65V, which seems high. Especially since the meter appears to work all the way down to 4.00V, below which the display fades out. The average current drawn is about 2.4mA. Thanks to user ‘lowimpedance’ and others for starting a discussion at the EEVBlog forum that provided inspiration for this project. This entry was posted in Repair and tagged DMM, Fluke, LCD, Vintage. Bookmark the permalink. I drilled two small holes in the vertical plastic of the LCD carrier so that I would not need to route wires around the ends. I wish I had thought of the “wire loom” strip you made to organize the wires. Makes everything much more “neat”. No complaints though, my repair has functioned well for almost two years now. I always loved the “radio buttons” on the 8020A (as opposed to a rotary knob). Made changing from ohms to volts, a one handed operation, so no need to drop the test leads. Very nice presentation, photos, and diagram. Pushing the LCD end pins in a bit to save more plastic on the carrier’s two “skinny” posts was a good call too. Mine stayed on, but there was not a lot of plastic left to keep them attached. Thanks for the kind feedback. Drilling holes to route the back wires sounds like a good idea, too. It’s nice to know others are bringing these old but very useable instruments back to life. Hope this inspires more to do the same. i may be able to use some ideas here for fixing my old Beckamn 320 that has the black display problem. Good luck on your Beckman. That LCD processor-chip stack-up affair might be a challenge. Let us know if you’re successful! readible so I replaced it using your wiring scheme. Excellent! Great job, and thanks for the report on your restored 8020B. The continuity tester on that model is the best/fastest I have ever used on any multimeter, new or old, cheap or expensive. It never misses. Im not sucking up to you, but thats a beautifull job done!! So dam neat and the result is cristal clear. Thanks. It’s all here for the looking, enjoy. The 8050A is 4-1/2 digits (20,000 count) so this LCD wouldn’t work. But there is a way to make an 8050A glow in the dark. Really great page you have here, which inspired me to start the work on my dad’s 8020A. What is interesting is that this is a newer 8020 (early 1980s) that sports a different supporting base which does not require the top to be milled – it already has an opening that nicely fits the LCD. I have another 8020A that has the same base as yours, and it will go through the same restoration path. Thank you! I have been able to fix my fluke 8020A. Your work has been a great help for me and I want to thank you a lot for your precious work. BTW, the case of the DVM I’ve got looks really bad and would like to bring it back to its original beige colour. Water and kitchen detergent does not make much a difference. Did someone find a non-damaging way (or product) to clean up the plastic case ? Thanks. I’ve always had pretty good luck with householder cleaners and some muscle. Mechanic’s hand cleaner and melamine (Magic Eraser) sponges are usually helpful. Check this related blog entry if you haven’t already. Also check the comments, somebody mentioned using effervescent denture cleaner, which sounds like a neat idea. You can also try an internet search for “Retro Bright”. It’s not so much a product as it is a recipe for a hydrogen peroxide-based concoction. I’ve never tried it, but it looks promising. I’ve tried baking soda mixed with water which helps clean the grime and bring back some of the original color of the plastic though mine still looks yellowish. I just fixed my dad’s old 8022A and this post was very helpful so just wanted to say thanks; especially the part about the drilled plastic strip, that’s genius! Thanks for the kind comments and the additional substitution info. Hope your Dad gets many more years out of his refurbished instrument. Found my old 8022A the other day, decided it was time to either find a replacement display or get rid of it. Didn’t have much hope until I found the lowimpedance post and then your awesome page describing the Lumex display. Ordered the display that day, installed it the day it arrived, and have been grinning ear to ear ever since…….. Thanks for all the work you put into the page, great pics, great drawings and great write up. And to be honest, I would have stuck it back on the shelf for another 20 years before I parted with it. Can confirm this fix also works with Fluke 8021B. Only issue is the LCD “holder” requires significantly more “machining” and that the front (closest to the input terminals) LCD pins need to either be shortened, or bent over significantly to clear the capacitors directly below them. Learned that one the hard way when I had my first repair attempt fail catastrophically with the LCD breaking and sheering the whole lower section off. Nice to hear about another rescue. Sparksalot over at the Antique Radio Forum also did his 8024B, and also learned the hard way about the importance of the new LCD sitting flat without any stress points. But he stuck with it and the final result was good. BTW, even with all the fancy late-model multimeters I have laying around, I still keep an 8021B sitting on my workbench, because it has an awesome fast continuity tester that’s great for tracing PCBs. It never misses. The worst part of the whole process was “machining” the LCD holder. So much plastic everywhere. That’s probably why I had the pressure points I did, because I was so done with cleaning up plastic shavings/dust. But the end result is just awesome. After some plastic polish on the lens, the LCD looks better than new. I’m actually curious which bit you used for this… because I tried both a Proxxon bit, and a Dremel general-purpose cutting bit, and they were both squirrelly as hell. The bit is a straight cutter from a Dremel brand 4 piece tungsten carbide cutter set that I thought was a bit pricey at the time, but has turned out to be a good investment. I think the number is 9901. Using a Proxxon instead of a Dremel taught me the importance of spindle runout. I only use the old Dremel for nasty rough work now. Also the Proxxon has more torque at lower speeds, which keeps the plastic from melting and clogging the bit. Awesome, thanks! What proxxon stand are you using? Is it the vise, or the drill press stand? Any ideas if this will work on an 8060? and if not any suggestions? The 8060A is a 4-1/2 digit meter, so this particular 3-1/2 digit replacement LCD will not work. I suppose it may be theoretically possible to find a generic 4-1/2 digit LCD with the right dimensions. But the original has some unique annunciators (Hz, dB, continuity bar) that a generic will not have. About the only source for a replacement is a parts donor, but finding one for a reasonable price may be hard. A working 8060A can still go for $80 or more on eBay. I replaced the display of my 1978 8020A in 2010. Its still in good shape and within specification. Inside was very clean. Initial reading were erratic, but since exercising the switches with alcohol cleaning – all readings are nearly identical to my brand new Fluke 117! However, I am having one problem: the center decimal point never turns off. I have been unable to see anything that may be causing it. Should I be suspecting a selector switch, or LCD/display driver? The decimal points and the low-battery annunciator are driven by a CD4030 CMOS quad XOR IC (U7). Below the display and to the left side. The DPs are controlled by DC logic levels that come from the selector switches and go to the gate inputs. The outputs to the LCD are all 50Hz square waves derived from the LCD backplane (BP) signal. When the gate input is logic low, the gate passes the BP signal straight through, and the LCD segment is OFF. When the gate input is logic high, the gate inverts the BP signal and the LCD segment will be ON. Inputs for the left, middle and right DPs are U7P13, U7P6, and U7P8. Measure these on DCV range, with respect to U7P7. About 5V DC or more for logic high (DP ON), and about zero for logic low (DP OFF). Outputs for the left, middle and right DPs are U7P11, U7P4, and U7P10. Measure these on ACV range, with respect to U7P2. About 5 to 6V AC for DP ON, and about zero for DP OFF. 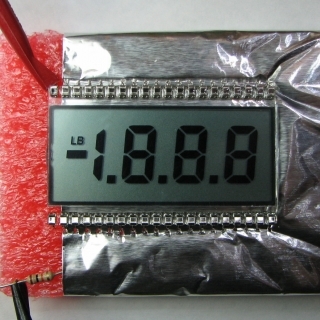 The exact voltage is unimportant, true RMS and non-true RMS meters will give different readings. Checking these levels with the switches in various positions should allow you to tell if the driver IC is faulty or the logic level going into the IC is stuck high for some reason. You can try to carefully peel the darkened rear polarizer off like in my photograph. Citrus cleaner/solvent helps. It can be replaced with a piece of bright white paper with some generic polarizing film on top. You will have to determine the correct orientation for the film. The contrast will be a little less than the original. I just want to thank you for the great suggestion! It was years I didn’t trash my old Fluke, Sperry-Univac gave me on my first day with them, because, even with a black display, I felt it was working (well, I had a look at some pins with a scope and they were alive…) and I wondered a day I could find a display. I just finished your rework and it shows nice digits: it looks brand new. I also managed to restore the original probes (high quality wire!) and, surprisingly, it shows perfect readings, better than any Chinese new multimeter. Congrats on the restoration job! Hope it gives you many more years of service. Thanks for a great piece of engineering work. I am working on my 1981 8020A today. I made a small ding on the plastic that is applied to the front of the new display. Can that be peeled off and discarded? Thanks again! It turns out the answer is yes!! Just a quick thanks – the displays on these used to die when they were new, too. I got a new lcd from Fluke when my meter was only a few years old, took about five minutes to replace and cost maybe ten bucks, I was ecstatic (a $200 meter in 1978 was a lot of money). So fast forward and I *knew* that getting a new display from Fluke was out of the question .. then I found your writeup. Oops. Well, maybe mail-order. Does Lafayette carry these, do you s’pose ? DIGIKEY has them for about $5 plus shipping.